It's summertime, the birds are singing, the girlies are out in halter tops, and the boys of All Too Flat are sweating (because of the heat, not the girls). We figured that if we were uncomfortably warm, then a good portion of the city would be as well. So as a public service, we decided to give out some ice pops to passers-by. But the way we figure it, you don't get something for nothing in New York City. So in order to get their icee, the recipient was going to have to make us laugh. Set up for this little jaunt was not so difficult (and it's lucky that it wasn't funny, either, since Kennyb didn't have a digital camera to record the event). The popice went into the freezer on a Thursday morning, with the hopes that they would be solid for our Sunday target date. A fair amount of discussion was had as to why it takes pop-ice so long to freeze. We decided it was the high sugar content. We made it to the park with the only incident being the annihilation of a few bagels. Once we arrived, the first thing on the agenda was for Kennyb and Ton to sit back and set Ben to working on the posters. We figured that since there were three of us, we should make three posters. Four were made, just in case. Then we got ready for some serious sitting. At first the wind gave us a little bit of a problem with the signs (see The Fool on the Hill) for a treatment on the relationship of lift and surface area in the context of kites), but that all got settled in just a little while by us holding onto the signs. Before long we were heavily entrenched behind our advertisements, and armed with icee's. We had staked out a portion of grass by the south entrance to the Great Lawn in Central Park ('round about the 75th street entrance. I think). The coolers are hidden behind the signs, so as to keep them out of the sun. One of the problems with this idea is that that the basic component of ice pops (ice) don't really stand up that well to the heat of a summer day. I'm happy to say that we made it through the best part of the day before we started handing out slush pops instead. An executive decision (it's nice having only founders working on a project like All Too Flat; every decision made is automatically a "executive" decision. Another executive decision that day was to get walnut raisin cream cheese on my bagel) was made to require a majority of us (two out of three) to be laughing at the same time before the pop ice could be considered won. This cut out some of the false positives from Kennyb or Ton laughing in the middle of a joke at nothing in particular (which happened fairly often). We were all somewhat surprised that there were so many takers. We were never really overwhelmed by a crowd, but we definitely had a steady stream of people. One estimate has the net decrease in ice pops over the course of the day coming in at over a hundred. Of course, it's unclear if this estimate takes into account the dozens of pops eaten by the three of us. What can I say, sometimes it's not about science. Not surprisingly, most of those who tried to make us laugh went with a standard joke approach. These jokes will be entered into the All Too Flat joke repository at our leisure. Not a few people took a different approach, however. We got a couple of people telling anecdotes, which we were pretty excited about at first. However, every anecdote told not only didn't strike us as funny, but actually struck us as actively not funny. One pair of latina girls tried their best to do a humerous dance, but didn't quite make it all the way through (and made us feel like dirty old men to boot). And then there was the one guy who bypassed the whole humor concept and took the physical challenge. 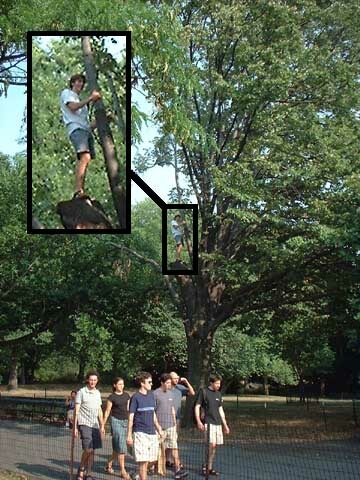 To be honest, I don't remember if any of us were laughing when the guy was climbing the tree, but we definitely thought he deserved an ice pop for the effort. One of the funnier things that happened during the day was the fact that after a little while, people would camp out near us to leech off the jokes that were being told. The numbers varied over the course of the day, but at the peak there were 8 hangers-on. Not too shabby! One of our watchers thought were were funny enough to link to from her web log (below, you can see what people did to show their support for something before they could link to it). Figure, we'll do the same. All in all, it was a pretty stinking good day. We got a lot of people asking us "Why are you doing this? ", "What's in this for you? ", and things like that. We all thought those were pretty funny questions. As far as we could calculate, we spent a total of $8.00 and were able to laugh for 4 hours straight. 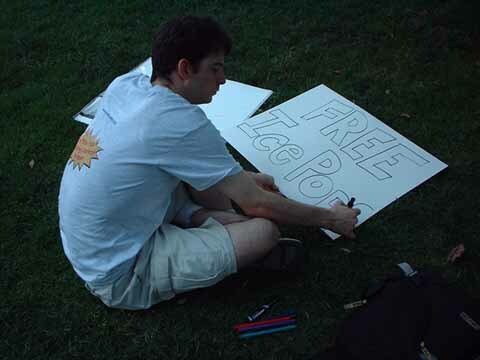 Hell, we even set it up so that if we didn't laugh, we wouldn't have to give away any ice pops. A serious win-win situation, in our opinion.